" Increasing temperatures, changing precipitation, rising sea level, more intense and frequent extreme weather events and melting glaciers, ice sheets and Arctic sea ice are some of the challenges for Europe already triggered by global climate change, says a report released today by the European Environment Agency, the World Health Organisation Regional Office for Europe and the Joint Research Centre of the European Commission. 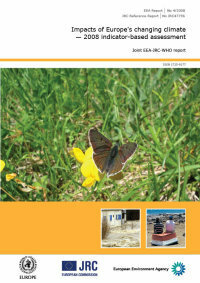 The report 'Impacts of Europe’s changing climate', based on 40 key indicators, stresses the consequences of both observed and projected changes, including an increased risk of floods and droughts, losses of biodiversity, threats to human health and damage to economic sectors such as energy, transport, forestry, agriculture, and tourism.
" The report presents past and projected climate change and impacts in Europe by means of about 40 indicators and identifies sectors and regions most vulnerable with a high need for adaptation. The report covers the following indicator categories: atmosphere and climate, cryosphere, marine biodiversity and ecosystems, water quantity (including river floods and droughts), freshwater quality and biodiversity, terrestrial ecosystems and biodiversity, soil, agriculture and forestry, human health. Furthermore the report shows the need for adaptation actions at EU, national and regional level and the need for enhanced monitoring, data collection and exchange and reducing uncertainties in projections. The report is a joined effort of the European Environment Agency (EEA), the European Commission's Joint Research Centre (JRC-IES) and the World Health Organisation Europe (WHO). " " In a HARDtalk programme broadcast on 6 October, Stephen Sackur talks to the Danish minister for climate and energy, Connie Hedegaard. With the world economy faltering and fears of a global recession growing, do politicians have the stomach for action on global warming? "